What is the torso support AM-TX-02? 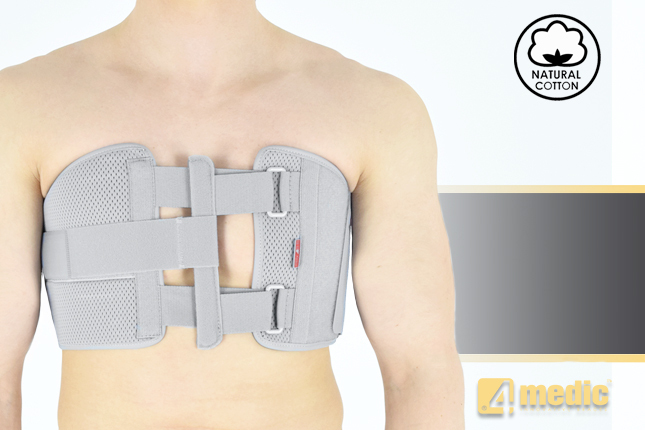 Our Thorax belt AM-TX-02 is the universal device that stabilizes chest and breastbone area precisely. On the front we use system of stabilizing orthopaedic stays and aluminium splint. The belt is made of cotton fabric what allows use it directly onto the skin. Because of the universal size, you can fit it without problem based on cutting the unnecessary part of the belt off. Non-elastic construction, firm polyamide buckles and stable frontal fastening guarantee the best po-op protection against the injury torn. This belt stabilizes ribs by chest compression and helps patient to breath with limited pain. Our rib belt is made of special orthopaedic 3D rubber called AirRubber II. Short rib belt AM-PZM-02 stabilizes ribs by chest compression and relieves the pain while inflammations (during deep breaths). Thanks to openwork construction the device allows maintain good body temperature, what improves healing and relieves the pain.